Pivot Point manufactures high-quality Wire Rope Lanyard assemblies, which are typically used as tethers for pins and other components to prevent loss, as well as for door restraint cables and other uses. 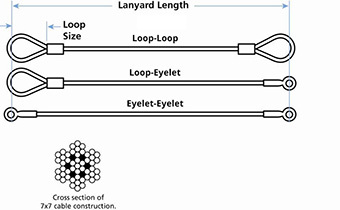 Stock Lanyards are available in 3/64” or 1/16” diameter wire rope. Choose from Galvanized or Stainless cable, coated or uncoated, 6” or 12” length and Loop-Loop, Loop-Eyelet, or Eyelet-Eyelet configuration. Custom Lanyards are available in other diameters, constructions, coatings and configurations, limited only by your imagination! Pivot Point stock lanyards are made from durable 7 x 7 aircraft cable, chosen for its strength and flexibility. Order stock lanyards now! With recent automation advances, Pivot Point produces high-quality Wire Rope Lanyards with fast lead times and prices competitive with imports. We also provide bulk cable if you wish to make your own steel lanyard assemblies. For low-cost alternatives for light-duty retention, Pivot Point exclusively offers Standard Nylon Lanyards™ and U-Lock Nylon Lanyards™. Pivot Point manufactures high-quality Wire Rope Lanyard assemblies, which are typically used as tethers for pins and other components to prevent loss, as well as for door restraint cables and other uses. 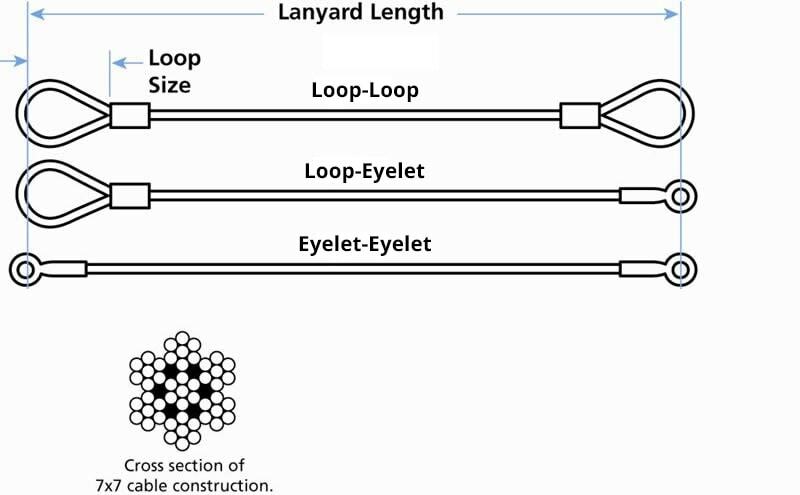 Stock Lanyards are available in 3/64” or 1/16” diameter wire rope. Choose from Galvanized or Stainless cable, coated or uncoated, 6” or 12” length and Type 1, 2 or 3 configuration.